Welcome to Pyramide Villa, a glamorously designed 3-bedroom villa, located in the Pointe Milou quartier, on the northeastern side of the tropical St. Bart’s. Sitting on half an acre of lush greenery that provides complete privacy from neighbouring properties, Villa Pyramide is perfectly poised to become the secluded getaway that you crave. Built as a single storey property, the villa earns its name from the architecture; the concrete and glass structure, crowned with red pyramid rooves, makes for lofty ceilings indoors. The half-acre of land that surrounds the villa has been cultivated into a tropical paradise, with several areas to sunbathe and lounge in, enjoying the heady fragrances of the carefully arranged flowers and plants sitting around the lily pond. The long form twin swimming pools offer the best view of the spectacular vista of the Caribbean and surrounding islands, ideal for cooling off quickly in the balmy climate of St. Bart’s. The pools also have a heating feature installed and is guaranteed to enchant and delight guests interested in basking in the warm waters in the evenings, as the sun sets. The highest ceiling in the villa soars 17 feet into the air at the apex, stretches across approximately 1,000 square feet of open plan lounge, kitchen and dining areas for guests to spread out and relax in. Looking out from the rear of the property, guests will have a westerly vantage point, and floor-to-ceiling windows and terrace doors ensure marvelous Caribbean sunsets are a joy to revel in, whether inside the villa or out on the terrace. Plush couches are arranged squarely around large coffee tables, an ideal spot for lively conversation and laughter, or to take a few quiet moments to relax with a book in hand. A separate media room is available for guests wishing to engage in some downtime to watch a movie and is equipped with a large 70-inch flat-screen TV and sound system. The kitchen is portioned off behind a sweeping curved counter, where a fully equipped, stainless steel gourmet kitchen resides; state-of-the-art appliances and modern, sleek cabinetry stand at the ready to aid guests in the preparation of sumptuous cuisine. Alongside the services of a private chef, and with the use of local produce, sampling the delights of the Caribbean through your taste buds has never been easier. A separate dining area sits adjacent to the lounge; alternatively, an outdoor dining area and gas barbeque is also available, elevating your al fresco dining experience to the next level. The bedrooms have all been outfitted with luxurious king size beds, with high quality linens to ensure maximum comfort. All three of the bedrooms have been equipped with en-suite bathrooms, with access to sizeable jacuzzis, ready and waiting to bring guests to a blissful state of relaxation in the bubbling waters, out on the private terraces afforded to each room. 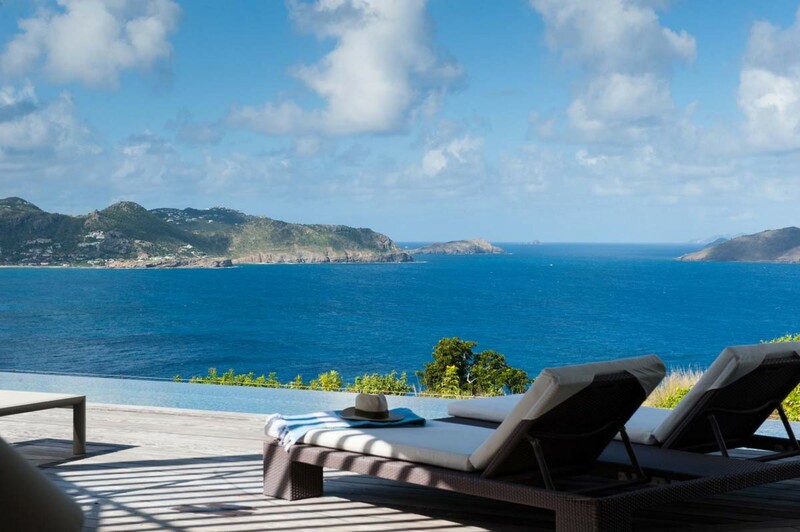 Situated on the Pointe Milou on St. Barts, Villa Pyramide lies on the eastern side of the island, close to the town of Lorient (2.8km), a beach resort town to the north with a modern shopping mall, L'Oasis, to explore at your leisure. Gustavia, the capital of the island, lies approximately 20 minutes to the west (8km), filled with an array of excellent boutiques, restaurants, night clubs and bars, some of the finest that any of the islands of the Caribbean offer its visitors. The size of the island is quite small, so this makes it easy to explore it in a matter of a few days, with an abundance of beaches to choose from. For watersports and all related activities, Grand Cul-De-Sac is close by, one of the best spots on the island for surfing, standup paddle-boarding, windsurfing, kayaking and many more options. If guests find an interest in the history of the island, a good place to start would be Gustavia itself, where the influences of past ruling countries remain today, including Fort Karl, left by the Swedish, to protect the island in the 1700’s.